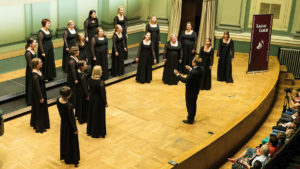 The most notable choral music event in Lithuania is the “Kaunas Cantat” International Choral Festival and Competition, which took place from 12 to 15 May 2016 in Kaunas. 4 days, 2 concert halls, 4 churches, and 8 countries (Lithuania, Latvia, Poland, the Czech Republic, Finland, Sweden, Germany, and Thailand). There were 10 choir categories, professional interpretations, various programmes, and big victories. 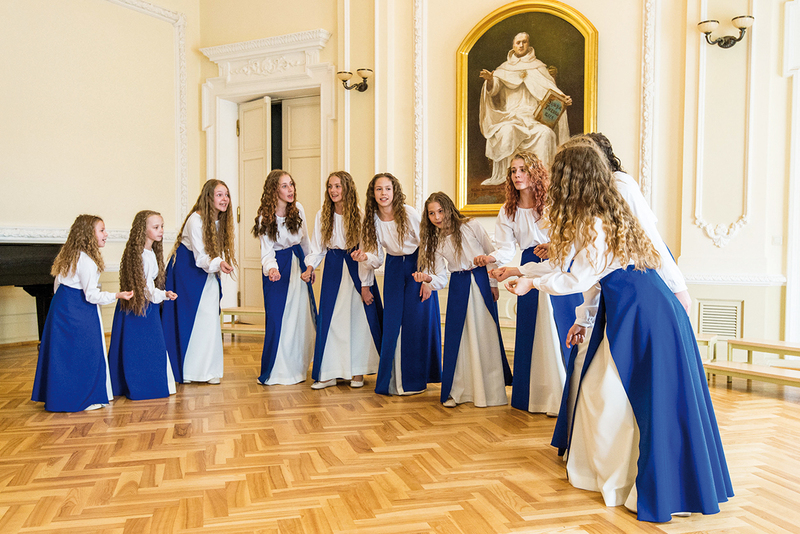 This is the sixth occasion for the Lithuanian audience, which opens up to the religious, folk, and composed choral music features of different regions. Rolandas Daugėla, the art director of the festival, claims that, during the six years of its existence, this event has become an integral part of Kaunas city’s cultural life. An essential element of the festival is choir competition, and it has become the crux for the participants and their programmes, which cover both the Mass and concerts. By tradition, this year’s choirs sang during Holy Mass at Vytautas’ Great Church of the Assumption of The Holy Virgin Mary, Holy Cross Church, Church of St. Francis Xavier, and St. George the Martyr Church. At the latter church on the third day of the festival, a night concert entitled “Cantus Nocturnus” took place, which every year brings ever more vivid emotions. A dark and sacred atmosphere fused with heartfelt chants creates, if not elevated religious feelings, then at least the human need for artistic fulfilment. The chairman of the professional jury was the famous Polish conductor and Dean of the Faculty of Fine Arts at the University of Warmia and Mazury, Benedykt Błoński. Its members include: Sergey Ekimov, who is a composer and a conductor, as well as a professor at the Rimsky-Korsakov Saint Petersburg State Conservatory; Raimondas Katinas, who is a choir conductor, a teacher, and the art director and chief conductor of the Lithuania Song Festival; and Rolandas Daugėla, a conductor, associate professor, and the artistic director of this festival. This jury was the primary draw for foreign choirs. Another attractive aspect of the festival was the venue – the prestigious Kaunas concert halls. 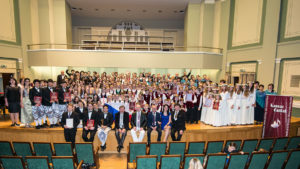 The competition lasted for two days (Friday and Saturday), and took place in the main hall of Vytautas Magnus University and at the Kaunas State Philharmonic. The flexible evaluation criterion in the competition was based on the song selection in the choir programme category, on interpretation, and on the level of professionalism of the conductor or concertmaster. Prizes were awarded in the form of cups for runner up and third place winners, and a Grand Prix Cup for first place. Indeed, this competition presents extremely favourable conditions for participants, who have significant opportunities to win at least one prize, and are also awarded with a record in the history of choir competition, which can often lead to the launch of future careers. The first day of the competition saw 7 choirs, 12 programmes, and 9 categories. Each choir represented different styles of choral music and different age categories, and choirs only competed with those in the same grouping as themselves. One could ask how competitive the festival really is, if almost every programme has only one competitor. This is where the competence of the jury is revealed – regardless of the number of the participants, choirs are judged only by the quality of the performance. Participating choirs included: the choir of Ozolnieku high school and boys’ choir “Spīguņi” from Latvia in the Children’s Choirs (A, A1) category; children’s choir “Radost Praga” (Czech Republic) which prepared programmes for Children’s, Youth (B1), Folk (L) and contemporary composed music (M) categories; ensemble “Rasa” from Kekava’s high school (Latvia), which competed in Ensembles (F) category; Thailand’s Mahidol university choir with their programmes in Youth under 25 years (C) and Spiritual, gospel, jazz (S) categories, mixed seniors (R) choir “Echo” (Poland) and women’s chamber choir “Resonus” (E). As we know, the desire for victory is an innate human drive that encourages us to constantly improve. For participants it is necessary, but for the viewer it is the most interesting. So from the viewer’s position, I want to summarize the most outstanding performances that brought full attention to them, and that made us listen and experience every single expression of sound. The art of being intriguing is as important as the other criteria of artistry or quality. Indeed, it was not a struggle for the viewer to pick the best ones – at the end of the first day, the jury announced the choirs that had presented the best performances, who would compete the next day for the Grand Prix cup. In the morning, after the performances of the selected choirs and the award ceremony, it finally became clear who, how, and why, since the overall essence of the entire competition is in some way reflected in the awards. All the participants were truly professional artists: the lowest award (silver diploma) went to only two choirs, and the other choirs won the gold diploma or higher. One silver winner was the choir of Ozolnieku high school, directed by Rūta Bergmane. They performed arrangements of Latvian folk songs, “Kalējs kala debesīs” (arranged by Andris Kontauts), and “Dzied’ , māsiņa , skaistas dziesmas“ (arranged by Janis Medins). Although they showed a sincere performance, they did not make it to the second stage of the competition because of poor intonation. The other choir that won silver was the girl’s ensemble “Rasa”, directed by Dace Bula. They also performed arranged Latvian folk songs, such as Dace Robule’s “Saule”, Selga Mence’s “Es bij meita”, and the sacred piece “Agnus Dei” by Dace Toločko. Their performance shined through their smooth choreography, unified singing, and perfect scenic image. For the last event, they received a special jury prize “for the best scenic image”, but they were not invited to compete for the Grand Prix. Other participants that were competitors for the main prize revealed the different strengths of choral art. The third place winner was boys’ choir “Spīguņi”, directed by Ingus Leilands and Irina Osipova. They performed arranged Latvian folk songs “Rīga dimd” by Līga Celma-Kursiete and “Suņi zaķim pēdas dzina” by Romualds Jermaks. With perfect intonation, stage effects, and delightful-looking burgundy-coloured costumes, they received not only the cup, but also the audience prize. 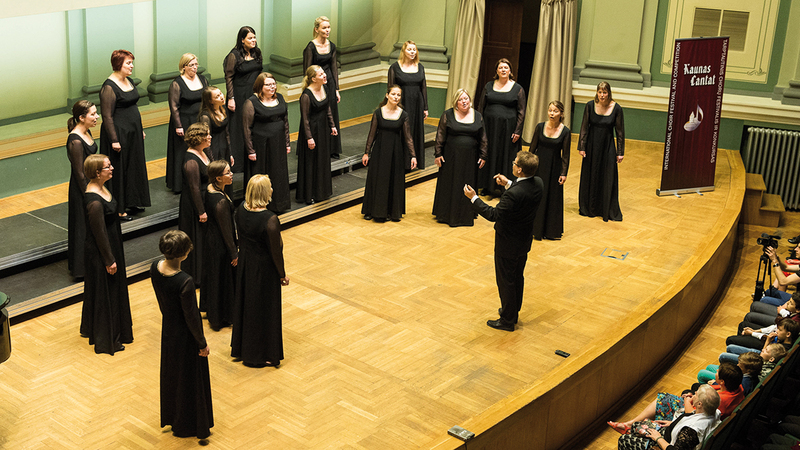 Second place went to women’s choir “Resonus”, which performed a programme rich with Scandinavian sounds. Since they chose to perform songs that required special voice subtlety and technique, Piotr Janczak’s “Kyrie” and Mia Makaroff’s “Ala sano ehka, jos voit sanoa kylla”, they received not only a jury acclaim, but also a special Composers Union Choras.lt prize “for the most compelling programme”. The competitors in this year’s festival can be described as professional, subtle, and artistic, and these choirs are connected by shared ideas. It is obvious that when people are led by ideas and desire, the results often surpass expectations. This is the case with two surprising, contrasting choirs – the Mahidol University mixed choir (directed by Rit Subsomboon) and the children’s and youth choir “Radost Praha” (directed Jan Pirner). From their first chords, these two choirs earned their victory. Both choirs shared an incredible combination of unity and quality that makes the listener forget the technical aspects of their performances and focus on the message of pieces. A Thai choir performed programmes for two categories, and showed its nature and talented spirit. 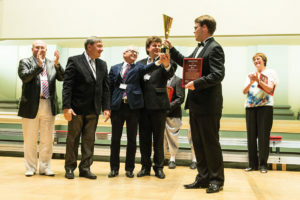 The choir won first place by performing contemporary religious choral music – Branko Stark’s “Plaudite Manibus” and Paul Caldwell and Sean Ivory’s spiritual “John the Revelator” – but thet were far from winning the Grand Prix Cup because of small inaccuracies in intonation. Not only quality of performance, but also the scenography and extraordinary skills of the concertmaster Teeranai Jirasirikul earned him the special jury prizes. However, there is no reason to doubt in the victory of the “Radost Praha” choir. This large group of talented girls, although it had serious opponents, did not experience a solid challenge. They performed programmes in 4 categories and demonstrated the exceptional sound quality and versatility of the choir. They started with opuses of Baroque composers and ended with contemporary composed music. Two performances of final pieces – Czech folk song “Pred muziku” (arranged by Petr Řezníček) and Jan Novák’s “Gloria” – were acclaimed with the Grand Prix Cup by jury. They won first place because of their unity, the patience of choir members and their director, and their shared love for choral music. 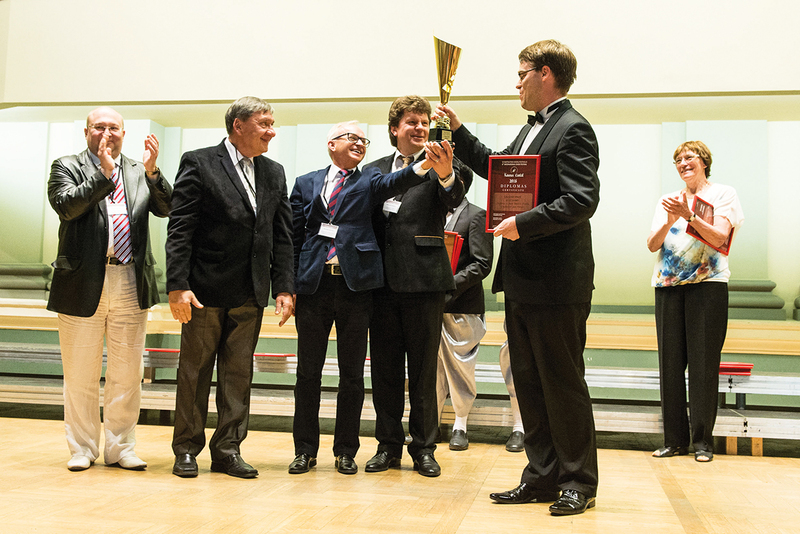 Besides the main prize, the choir won 4 gold diplomas, their concertmaster Jitka Nešverova earned a name of best concertmaster, and Jan Pirner received the best conductor award. 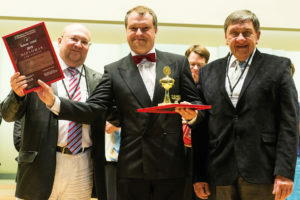 A concert of the competition winners “Cantus Nocturnus” was held on Saturday evening, and it became a reflection of the two days of the festival. By then, the performers had calmed down after intense performances, and the peace of the night in the sacred atmosphere of the St. George the Martyr Church inspired the sound of the music. Choirs that performed in this final concert once again proved their talent, and the first place winning choir lowered its temperamental tones to calm ones. I believe the moment of calmness and concentration inspired one thought from the audience: the “Kaunas Cantat” festival is a truly gift for Lithuanian choral music lovers and they would like to witness more high-level choral art events like this one.